The Bible is rich with complex and diverse material on the topic of money and possessions. Indeed, a close look at many scriptural texts reveals that economics is a core preoccupation of the biblical tradition. 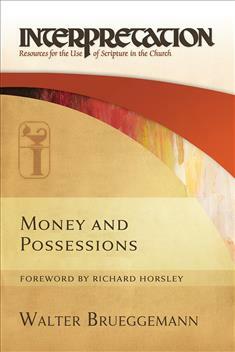 In this new work, highly regarded preacher and scholar Walter Brueggemann explores the recurring theme of money and possessions in the Old and New Testaments. He proposes six theses concerning money and possessions in the Bible, observing their contradictory nature to the conventional wisdom and practice of both the ancient world and today's society. Brueggemann advises us to reassess the ways in which our society engages—or does not engage—questions of money and possessions as carriers of social possibility. He invites the church to move toward an alternative neighborly economy that is more consistent with the gospel we confess.